Installing Google Analytics on your website is fairly straightforward, no matter what website platform you’re using. But after you’ve added the code to your website, do you know what you need to do with it? One of the most important things you should be doing is tracking all your conversions in Google Analytics. 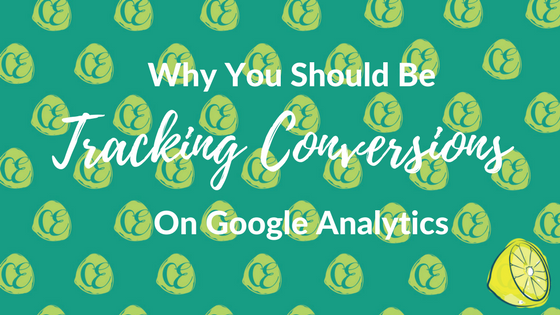 But do you know what kind of conversions you need to track and why you should be tracking conversions in Google Analytics? Knowing what actions people are taking and when is crucial if you want to improve your online marketing efforts. It’s also of key importance if you want to track the performance of your marketing campaigns, whether they’re online or offline. If you’re doing any kind of advertising, whether free or paid, online or offline, chances are people will come to your website. And when they do, you want to know exactly what they do while they are there. Are they bouncing off it within a few measly seconds? Are they just clicking on one or two pages? Are they spending a few minutes looking around, visiting multiple pages to find out who you are and what you can offer them? How long do they spend reading your blogs? Or are they just interested in finding your contact information or making a purchase? All these stats are readily available in Google Analytics and should be checked regularly. However, measuring conversions on Google Analytics is the clearest way to see what percentage of your visitors are generating you with an income, or taking the action you want them to take. There is no point knowing you have 10,000 visitors every month if you don’t know how many of them are turning into actual paying customers. So What Kind Of Conversions Should You Be Tracking In Google Analytics? Every action you want someone to take on your website should be tracked as a conversion. You can choose to track your goals in Google Analytics in different ways. The most useful type of goal to track is visits to specific URLs. This is because then you know they’ve taken the action you want them to take. Examples are a URL that appears after someone makes a purchase, a URL that appears after someone submits a form, or a URL that appears after someone downloads your PDF. For this reason, you HAVE TO create unique URLs for these conversions. These pages are commonly referred to as thank you URLs. This allows you to track visits to that URL as a goal and then you’ve got clear evidence of the action they’ve taken. Time on site as a goal is far less valuable – we all know how easy it is to have a million browser tabs open and not be paying attention to any of them! Number of pages visited is much more useful as a metric, but nothing will beat tracking visits to specific URLs as tangible goals. Are you tracking your conversions properly in Google Analytics? Do you even know what conversions you should be tracking? If Google Analytics is something that you’ve been ignoring for too long, get in touch with me today and let me help you put that right as part of your SEO set up.